Difficulty resets every 2016 blocks or 2 weeks assuming all blocks are solved in an average of 10 minutes each. Lets look at some of the recent increases in difficulty. Its important to realize that difficulty increases due to an increase in hashing power by miners. When prices in BTC are high miners are encouraged to upgrade their hardware. The Spike in prices back in December likely caused a surge in orders for new ASIC miners. Unfortuntately delivery for said hardware is slow sometimes taking months from the time of payment til hardware is in miners hands. As a result a price spike in December won't be fully realized on the network for about 3 months. Thankfully the increase in March has been slowing. Considering a difficulty of 3462 G with bitcoin's current prices ( about $8k ). Anyone with electricity at or above 26 cents per KWH is now loosing money. The question is what happens to profits when the difficulty increases. 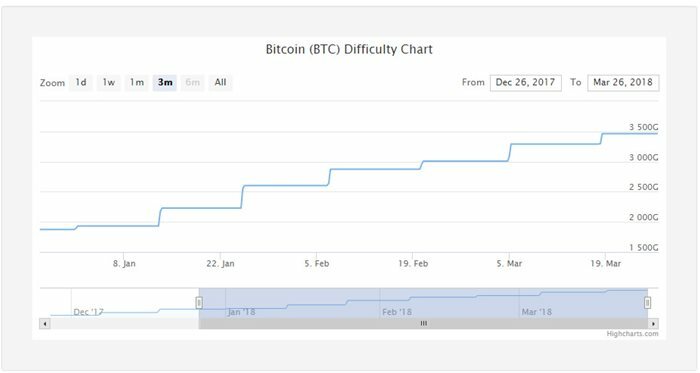 Lets say difficulty continues to increase at the rate of 10% per cycle ( 2 weeks ). If so here is the projected increases. At this point ( sometime after July 15th ) half the country is no longer able to mine profitably. Of course when profits are squeezed this much most miners would just turn their hardware off. Summer time will be even harder on miners as they won't be able to rely on the cold of winter to keep their miners cool. In reality the closer we get to a zero profit difficulty the rate at which the difficulty grows will decrease. Even if the zero profit rates go below the national average their are mining farms with whole sale electric rates that are sitting at 4 cents per KWH. But areas around the country are starting to resist mining farms. They don't bring any jobs to the area, and they aren't providing any kind of service to the local community. On the positive side. Long periods of low profits are usually followed by spikes in profitability. Kind of like the housing crisis in 2008. Tighter credit requriements, and too much inventory caused the prices of homes to drop. Lack of demand caused many builders to go out of business. However this was followed by a slow and steady increase in demand and home prices. Without the builders to saturate the market prices continued to go up. The same is likely to happen to bitcoin prices. So if you are sitting with a ton of hardware, Just wait it out, or sell it while prices are still decent.